For those of you who know us...you will know that Erich and I LOVE books. In fact, it was our mutual love of reading that drew us to one another in the first place...(I remember thinking I could definitely marry a man that could read Even Cowgirls Get the Blues. ) So since we've been thinking and talking about self-sufficiency, we've been reading... A LOT. We are faithful friends of our public library and usually have between 40 and 50 books signed out at a time. I am always so amazed that this service is available to us at no charge. Their vast collection always surprises me and even when my local library doesn't have the book I want on hand, I can put a hold on it and they will let me know when it comes in. Delightful! I often pull away from the library, laughing evilly as if I have gotten away with something...I mean really, doesn't it just seem too good to be true sometimes? The first book we read was this one.. 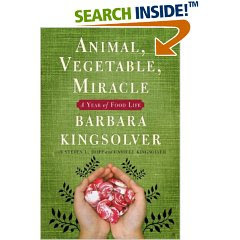 I love Barbara Kingsolver. I have enjoyed her fiction writing and her short essays before, so when I saw that she had written a book about her family's efforts at self-sufficiency and eating locally, I felt I could justify adding this one to my personal collection so I used some of my gift cards and ordered it. As usual, her writing had us both laughing, gasping and nodding our heads as we read through it. It's a book we both refer to often...as in "I'd like to make cheese...like Barbara" or "wouldn't it be great to raise turkeys...like Barbara?". "I want to live in a society where people are intoxicated with the joy of making things." 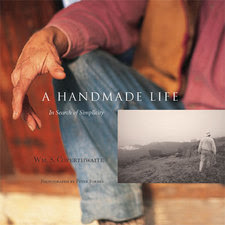 One of the books recommended to us was the one pictured above by William Coperthwaite, A Handmade Life. In the book, he talks a lot about hand-crafting, from tools, to clothing to housing. I just love the image of the hand on the front of the book. He also talks a lot about living simply and the impact of this type of lifestyle on community and society. He also introduced us to yurts, which we briefly considered as a housing option. "We have no intention of making money, nor do we seek wages or profits. Rather we aim to earn a livelihood, as far as possible on a use economy basis. When enough bread labor has been performed to secure the year's living, we will stop earning until the next crop season. Ideas of "making money" or "getting rich" have given people a perverted view of economic principles. The object of economic effort is not money but livelihood. Money cannot feed, clothe or shelter. Money is a medium of exchange, - a means of securing the items that make up livelihood. It is the necessaries and decencies which are important, not the money which may be exchanged for them. And money must be paid for, like anything else. Robert Louis Stevenson wrote in Men and Books, "Money is a commodity to be bought or not to be bought, a luxury in which we may either indulge or stint ourselves, like any other. And there are many luxuries that we may legimitately prefer to it, such as a grateful conscience, a country life, or the woman of our inclination." And with new work his industry content." Virgil, Georgics Book II, 29 B.C. I'm currently reading the section on keeping sheep...stay tuned for more about that! Got any recommendations for us? Please leave us a comment! I love the image of the hand on A Handmade Life too, Joanne. Every once in awhile I think about the many, many things my own hands do each day, and I am truly amazed by them; from kneading bread, planting seeds, holding tools, pulling weeds, wiping the tears from a child's face, cutting our hair and so much more my hands have never let me down. Recommendations heh? 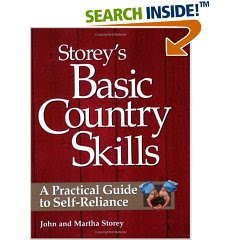 How about The Encyclopedia of Country Living by Carla Emery or The Self-sufficient Life and How to Live it. Have you read Readers Digest Back-to-Basics book? Oooh there are just so many good books. You must be so excited to know that soon you will be putting all these new skills to practice. Thanks Heather...you know that you are our go-to person for book recommendations! I have the self-sufficient life on hold already at the library...what did you think of the Rural Renaissance? It didn't strike a chord with me as much as the Nearing's book. I like the illustrations in The Self-sufficient Life, especially the garden ones. I'm also liking Four-Season Harvest by Eliot Coleman, but it is just all about growing veg in the Winter, not really an all around country living book. The reason I ordered it is because he was mentioned in Fields of Plenty as knowing and living with the Nearings for awhile. Joanne laughs gleefully at the thought of herself laughing evilly. What will I miss most about the Okanagan?